WARRI, Nigeria — More than 50 people are missing after a leaking oil pipeline exploded and caused a stampede in southern Nigeria, a local official said Saturday. The blast early Friday caused massive oil spillage in the Nembe kingdom in Bayelsa state, the Nembe Chiefs Council spokesman, Chief Nengi James-Eriworio, told The Associated Press. The Nembe trunk line is operated by the Port Harcourt-based Aiteo Group and carries crude to the Bonny export terminal. Aiteo had yet to comment on the explosion. It was not immediately clear if the pipeline had been shut down. 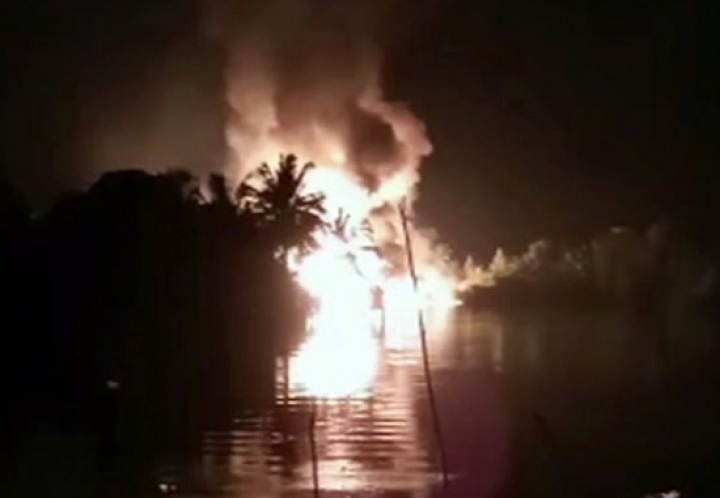 Video obtained by the AP shows a large blaze from the ruptured pipeline at night as villagers look on. "If they turn off the oil well from the station, the pressure inside the pipeline would reduce, causing the flame to burn out," one person is heard in the background explaining. Deadly accidents caused by leaking pipelines are alarmingly common. In January, an overturned oil tanker exploded in Odukpani in Cross River state while dozens of people were scooping up the leaking fuel. Police said at least 12 people were killed while some witnesses estimated up to 60 were dead. Hundreds of people have died in similar accidents in recent years in Africa's largest oil producer as impoverished people risk their lives to collect fuel leaking from pipelines or trucks. This version corrects by removing reference to Agip, Oando and Shell Petroleum Development Company as joint owners of the pipeline.